We have the pleasure to invite you to an exhibition presenting one of the most important discoveries made by the mission of the Polish Centre of Mediterranean Archaeology UW in Saqqara (Egypt), organized by PCMA UW in cooperation with the State Archaeological Museum in Warsaw and the Polish-Egyptian Archaeological Mission Saqqara. Thirty years have passed since the PCMA UW mission started excavating in Saqqara, and twenty since one of the most spectacular discoveries was made – the discovery of the tomb of vizier Merefnebef (23rd century BC). This event also aims to honour the thirty years of work in Saqqara of Prof. Karol Myśliwiec, founder and long-standing (until 2016) director of the mission. The main component of the exhibition is a life-size model of Merefenebef’s funerary chapel. The walls of the original chapel are decorated with polychrome reliefs which depict scenes from the life of an Egyptian dignitary from 4400 years ago. The model is preceded by an exhibition explaining the importance and context of the discovery, including the history of Polish excavations and Egyptian funerary practices. Also displayed will be objects from the National Museum in Warsaw collection which have never been shown before and copies of the finds from the necropolis of dignitaries in Saqqara made by the mission’s restorers. 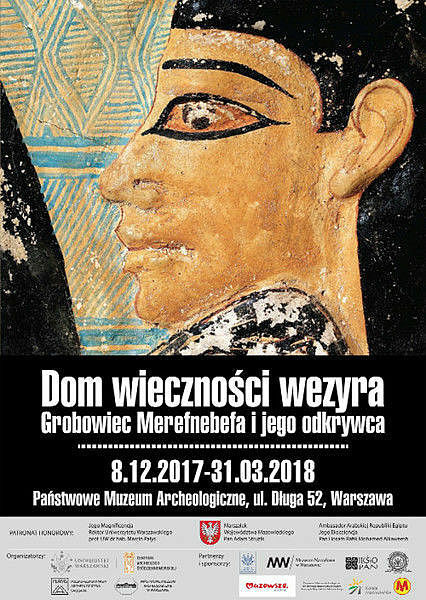 The exhibition was co-financed by the Polish Centre of Mediterranean Archaeology UW, the StateArchaeologicalMuseum in Warsaw, the University of Warsaw Foundation and the Faculty of Oriental Studies UW.